During the meditation he continuously had the darshan of Swami’s murti. Swami asked him to remain attentive. On the tenth evening of his meditation, he saw an intense light in which he had the darshan of the graceful divine murti of Shriji Maharaj. He was dressed in saffron robes. Pragji Bhakta’s joy at the sight of the divine figure of Shriji Maharaj was boundless. Tears overflowed from his eyes. He enjoyed this darshan. Shriji Maharaj smiled and said, “Swami has earned you this merit.” Then He disappeared. But now Pragji Bhakta began to see Maharaj’s divine murti continuously in his heart. So saying, Swami looked at him and Pragji Bhakta had the darshan of the divine and graceful murti of Shriji Maharaj in Akshardham, dressed in glittering garments and ornaments. Pragji Bhakta’s joy knew no bounds. His heart danced with joy. Now he was impatient to reveal Swami’s greatness to the people. Thus, Swami fulfilled the promise which he had given to Pragji three years previously. Thus Swami appointed Pragji as the guru of all his devotees. He instructed Pragji Bhakta to preach to and purify all the devotees. Also, Swami commanded Pragji to reveal the true form of Mul Akshar in Satsang, and to make people fearless by giving a divine assurance that they will experience divine bliss if they worship Shriji Maharaj. By his contact with the paras, Pragji himself had now become a paras. Now he had no fear. 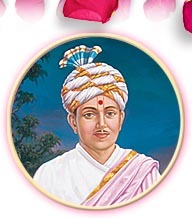 He started telling people, “Gunatitanand Swami is the manifestation of Mul Akshar, the divine abode of Shriji Maharaj.” He intuitively knew the desires of the devotees and brought them to Swami for atonement and purification. Word went round the entire Satsang that Swami fulfills all the wishes of Pragji Bhakta. Pragji Bhakta’s father left his mortal body and was blessed with Akshardham. Pragji Bhakta was reluctant to go to Mahuva, but Gunatitanand Swami told him to pay a visit. It was his first visit to Mahuva for four years. There, he stayed in the mandir and talked to the devotees about the greatness and divine power of Gunatitanand Swami.